Shane Linder makes a welcome return to form with this month's article and I hope to introduce it without using the phrase "Out of Africa" - that most over used of all terms when talking about fish from in the dark continent. So, avoiding any further cliche, I'll turn up the volume on the "Best of Toto" album I'm listening to and hand over to Shane. The say you never forget your first... and I have to say that as the first Synodontis I collected in the wild S. afrofischeri will always hold a special place in my heart. First described by Hilgendorf, 1888 from Lake Victoria S. afrofischeri, as currently understood, probably represents a flock of closely related species. This should come as no surprise when the species' holotype location is as broadly defined as the largest tropical lake in the world. Lake Victoria is 26,600 mi sq or 68800 km sq. For comparison purposes, the country of Scotland is 30,414 mi sq. and that includes a lot of islands! Prior to the introduction of the Nile Perch in the 1950s, S. afrofischeri, or the Victoria squeaker, was widespread throughout the lake. S. afrofischeri, like many other Victorian fishes, had to adapt to this introduced predator if it wished to survive. Luckily it is an extremely adaptable animal. It can live in waters that range from alkaline (pH 7.8) to waters that are quite acidic (pH 6.0) and can easily tolerate a range of temperatures from the upper 60s to lower 80s Fahrenheit. Perhaps more importantly it can adapt to areas with thick underwater plant structures, like papyrus swamps and stands of hippo grass, as well as water with very low oxygen levels. Nile perch can not adapt to either of these environments. S. afrofischeri is able to live in waters with very low oxygen levels as it employs aquatic surface respiration (ASR). ASR works because even in hypoxic water diffusion from the atmosphere provides a thin, well oxygenated micro layer of surface water. S. afrofischeri can use this micro layer to breath by slightly emersing its snout and swimming forward. The above adaptations make S. afrofischeri an ideal aquarium inhabitant. My own specimens, collected at Lake Nabugabo, quickly adapted to captivity and within two weeks of capture were eating dry aquarium foods with gusto. I have found them to be very active and now, after a month in captivity, come out to beg for food even with the aquarium lights on. My pair constantly chase each other around the tank, but their manner is more playful than aggressive. They appreciate a good amount of structure in the aquaria which can be formed with stones, driftwood, and/or plants. 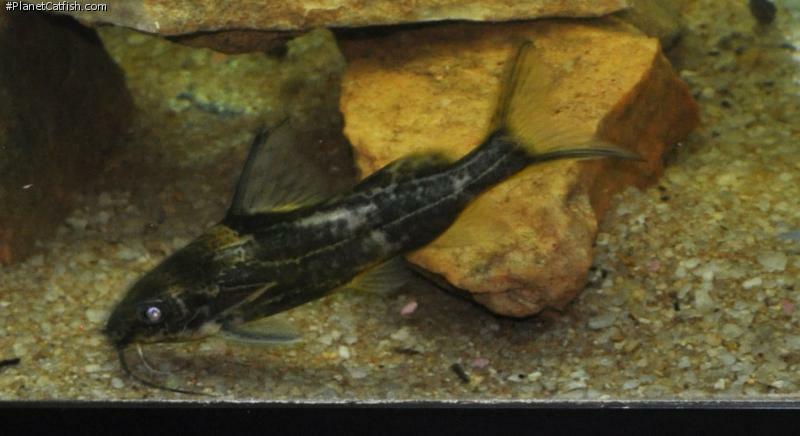 Identification of many Synodontis can be problematic. This is especially the case with S. afrofischeri. DNA sequencing of S. afrofischeri has revealed that S. afrofischeri, as currently defined, probably represents two, maybe even three, distinct species. This is complicated even further by this species cryptic, and quite variable, coloration and markings patterns. Taking these issues in to account, it is easy to see why there is confusion in the aquarium hobby over what S. afrofischeri looks like. The photos under the species profile taken by me match very well with Hilgendorf's original description and thus likely represent the “real” S. afrofischeri as he described it. Type Locality Lake Ukerewe, Victoria Nyanaza. Etymology Synodontis: From the Greek syn, meaning together, and odontos, meaning tooth; in reference to the closely-spaced lower jaw teeth. In honour of the German researcher Dr.G.A. Fischer, who collected the first species of fishes known to science from Lake Victoria and some other places within East Africa. Size 177mm or 7" SL. Find near, nearer or same sized spp. Maxillary barbels reaching almost to the origin of the pelvic fin in some specimens and to the tip of the humeral process in others. Outer mandibular barbels with slender branches, inner pair with shorter, but slender branches. Marbled yellowish-brown (marbling is extremely variable, some individuals uniformly brown). A quite constant feature is a dark to black band from the eye to the mouth and two irregular light vertical bands anteriorly and posteriorly of the adipose fin. It is difficult to distinguish juvenile S.afrofisceri from juvenile S.fuelleborni by coloration only. General Remarks Rarely grows to lengths greater than 15 cm SL. In the Piti River specimens at two occasions were caught between dense vegetation near the river banks. This species has adapted to a wide variety of habitats and thrives equally as well in the hard, alkaline waters of Lake Victoria as in the soft, acidic waters of swamps. Distribution Africa: Lake Victoria, Lake Nabugabo, Victoria Nile, Lake Kyoga, Kagera River, Ihema Lake, Kingani River, Malagarasi (Nile Basin). Feeding Feeds on molluscs and insects, particularly chironomid larvae and Povilla. Furniture Historically (until the 1960s) this species was found throughout the Lake Victoria basin in a wide variety of habitats. Today, due to predation by the Nile Perch, they are primarily restricted to heavily vegetated swamps and feeder rivers that Nile Perch can not enter, as well as thick strands of reeds or hippo grass on the lake's margins. In captivity they will thrive in set ups as diverse as a rock habitat for Victorian Haplochromids to a Victorian papyrus swamp populated with Ctenopoma and larger killie fishes. Compatibility A peaceful fish, but should not be kept with very small fishes which it may mistake for food. Breeding Chapman, Kaufman, and Chapman (1994) Why Swim Upside Down? A comparative study of two Mochokid catfishes. Copeia. 1994 (1) pp 130-135. References that some of the S. afrofischeri used in their study were specimens obtained from a captive spawning in the Lake Victoria exhibit at the Franklin Park Zoo in Boston. No further details are given. Is thought to spawn in the Piti River or the Rungwa drainage at the beginning of the rains in November/December.